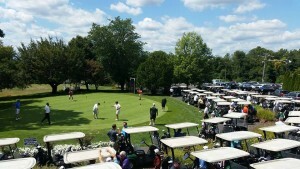 Middletown Country Club is the perfect venue to hold your golf outing. We can accommodate groups of guests anywhere from 24 to 140 players. With the options of utilizing Hacker’s Pub and Grill, the Windsor Room, the Manor Room, or the Ball Room, we can host your outing in a comfortable setting. We can tailor your event to suit your needs as well as budget. PGA Professional Dan Hoban and Executive Chef William Garber can customize your event to make your day a pleasant and very memorable one. We do require a $300 deposit for golf and a $300 deposit for any food/beverage selections. All events require 10 days of lead time. Shotgun starts are at the discretion of the head golf professional.